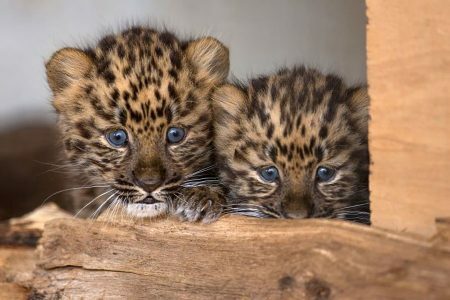 The award-winning Yorkshire Wildlife Park is providing a ray of hope for the world’s most endangered big cat – with the birth of three Amur Leopard cubs. The rare cubs, one of the most threatened species on the planet, were born on June 28 at the innovative park and their progress is a landmark in the international conservation programme. Only 70 of the majestic animals survive in the wild in the Far East of Russia and China and the fight to rebuild their numbers has been painstaking. Since their birth nearly two months ago every minute of their lives, including their birth, has been captured on film, with CCTV cameras. They are unlikely to be seen in public for a few weeks and will be vaccinated later this week. The three cubs and their parents, Drake and Freya, could be critical in an international plan to reintroduce them back into the native habitat for Amur Leopards in a remote region of the far east of Russia. Amur Leopard numbers dwindled because of disappearing habitat and poaching but conditions have stabilised and the Amur Tiger and Leopard Alliance (ALTA) recently announced plans for a re-introduction in the Lazovsky Nature Reserve in Southern Sikhote Alin, an area where leopards disappeared approximately 30 years ago. Increased conservation efforts in Russia and China combined with an increase in the leopards traditional prey of sika deer has provided confidence that a new population of 30 animals could be re-established over the next 15 years. The park puts conservation and welfare at the heart of all its activities and has established itself at the forefront of international campaigns to save species. The YWP Amur Leopard reserve, Leopard Heights, won the BIAZA award for Significant Advances in Animal Husbandry and Welfare in 2013. The innovative design allows Drake and Freya to behaviour naturally in one of the world’s largest Amur leopard reserves, leading them to rear three cubs without any staff intervention. Visitors to YWP have played a crucial part in the programme as the Amur Leopard and Tiger Alliance is one of the charities supported by the Yorkshire Wildlife Park Foundation. The park has already announced another breeding success this summer – three Amur Tiger cubs, Hector, Harley and Hope, were born on March 29 and are a significant step forward in the conservation of that species. Amur Tigers are also native to the Far East of Russia.